Amazon has revealed its game-face to the world, with the launch of a new gaming studio and Facebook game. Amazon has kept the fact that it was getting into social gaming rather quiet - although job vacancies within the company for devs threatened to give the game away - but it has revealed its new gaming arm in a blog post – announcing both a new game and the arrival of its games studio. "Amazon Game Studios is exactly what it sounds like: a new team at Amazon that's focused on creating innovative, fun and well-crafted games," explained the post. "Our first title, Living Classics, is debuting on Facebook today." Living Classics is free and doesn't exactly smack of originality – it's a moving object game set to a backdrop of classic children's books – but the mere fact Amazon is muscling in on the rather lucrative social gaming market is interesting. Amazon's reason for getting into gaming is rather woolly, though, explaining on its blog: "Why is Amazon making social games, you ask? Good question! We know that many Amazon customers enjoy playing games – including free-to-play social games – and thanks to Amazon's know-how, we believe we can deliver a great, accessible gaming experience that gamers and our customers can play any time." Considering the billions the likes of Zynga and Rovi are making from games, we're guessing the potential to make lots of money is a major factor in this as well. Although Facebook is the first platform it is launching on, with the rise of its own app store and its lofty ambitions for the Kindle Fire, it won't be long before we see more Amazon titles hitting the market. 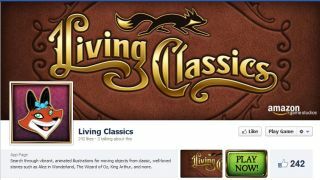 You can check out Living Classics by heading over to http://apps.facebook.com/LivingClassics.